Pen and brown ink and wash, with white opaque watercolor, over black chalk, with some black chalk worked wet, on laid paper. Purchased on the Edwin H. Herzog Fund. Inscribed at lower center, in pen and brown ink: "Parmeggiano - from the collection of / the Duke of Alva". Modesto Ignazio Bonaventura Luigi Genevosio [formerly Count Gelosi] (1719-1795; Lugt 545), Turin; Duke of Alva or Alba (according to inscription on drawing); possibly the Earl of Warwick (according to Denison 1990 - this might be a mistake for Parmegianino's Apollo and Marsyas which was Warwick); Rev. Dr. C. J. Ball (1851?-1924), Bletchington Rectory, Oxford; his sale, Oxford, Franklin and Jones, 28 March 1924; R.V. Lennard (1885-1967), Oxford;, by descent to Mrs. M. Munby; sale, London, Sotheby's, 4 July 1988, lot 12; acquired at sale on the Morgan's behalf by Richard Day, London. Niccolò dell’Abate’s early career evolved in northern Italy, very much under the influence of the works of Correggio and especially Parmigianino, until his departure for France. Son of a sculptor in stucco, Niccolò neither trained with a leading artist nor went to Rome. In around 1540 he created his first major fresco cycle, consisting of scenes from Virgil’s Aeneid, at the stronghold of Scandiano near Modena for Conte Giulio Boiardo. The artist took up residence in Bologna in 1546. There, he contributed to the decoration of four rooms in the Palazzo Poggi and a frieze with episodes from Livy’s History of Rome in the Palazzo Torfanini. He was summoned in 1552 to the court of Henri II in France, for whom he mainly worked at the royal palace in Fontainebleau, and in addition to paintings produced designs for enamels, tapestries, and ephemeral decorations. He and Primaticcio are considered the founders of the school of Fontainebleau. 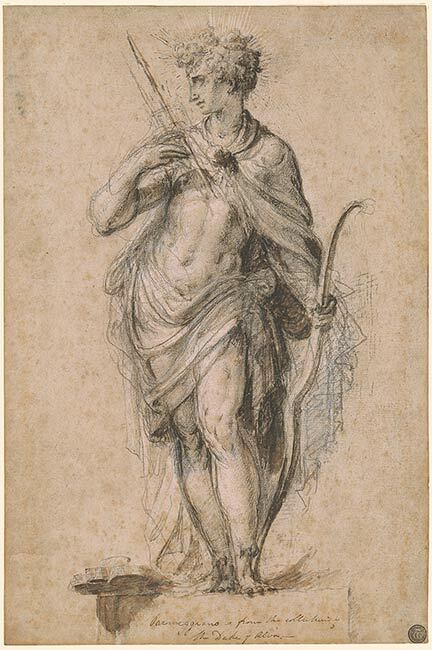 As first proposed by Cara Denison, the drawing is likely a study for the figure of the god Apollo in Niccolò’s design for the clock on the tower of the Palazzo Pubblico in Bologna, which is documented in a drawing from his hand in the Louvre.3 Made before the artist’s departure for Fontainebleau in 1552, the Louvre drawing depicts the clock face as a sun surrounded by the twelve signs of the zodiac. This is flanked on the left by a personification of Time and on the right by a standing figure of Apollo. The sun god, who closely resembles the Morgan figure in pose and drapery, holds a lyre in his left hand and points downward with his right toward a seated soldier personifying the city of Bologna. He stands on a ledge similar to the pedestal indicated near the lower edge of the Morgan drawing. What looks like part of the ledge in the Paris sheet has been identified by Denison as the ornamental knob and curved volutes of a strongly foreshortened lyre placed on its back. A drawing in the Kupferstichkabinett, Berlin, seems to be a copy of the Paris design.4 Dominique Cordellier rejected the connection between the two drawings on the grounds that the Louvre Apollo holds a harp rather than a bow and because the style of draftsmanship is more akin to that found in studies made for Palazzo Torfanini.5 The similarity of pose, however, the comparable direction of action and light, and the fact that both figures stand on pedestals strongly argue for a connection between the complete design and the Morgan sheet. Musée du Louvre, Paris, inv. 5844. See Paris 2001, no. 37. Musée des Beaux-Arts, Besançon, inv. d.1745. See Bologna 1969, no. 42. Musée du Louvre, Paris, inv. 5881. See Bologna 1969, no. 39; Denison 1990, 267; Bologna 2002, no. 63. Kupferstichkabinett, Berlin, inv. KK 15691. Paris 2001, under no. 38; Bologna 2002, no. 63. DBI 1960–, 9:686–96, in particular 689. Insignia degli Anziani del Comune, 1550, 1:1, fol. 426, Archivio di Stato, Bologna; cited by Bargamini in Fortunati Pietrantonio 1986, 284. Rhoda Eitel-Porter and and John Marciari, Italian Renaissance Drawings at the Morgan Library & Museum, New York, 2019, no. 85. Denison, Cara D. "An Apollo by Niccolò dell'Abate", Master Drawings. New York: Master Drawings Association, vol. 28, no. 3, 1990, p. 265-267, fig. 1. Selected references: Denison 1990, passim; Béguin 1991, 83, 89; Fortunati 1995, 157; Bologna 2002, 244, under no. 63; Modena 2005, no. 121. Watermark: angel holding a lily surmounted by a six-pointed star (compare ot Briquet 626: Reggio-Emilia, 1545; 626: Reggio-Emilia, 1554; 625: Vicenza, 1547).